Since 1997, Austine Studios and Maui Jim have had a very special relationship. 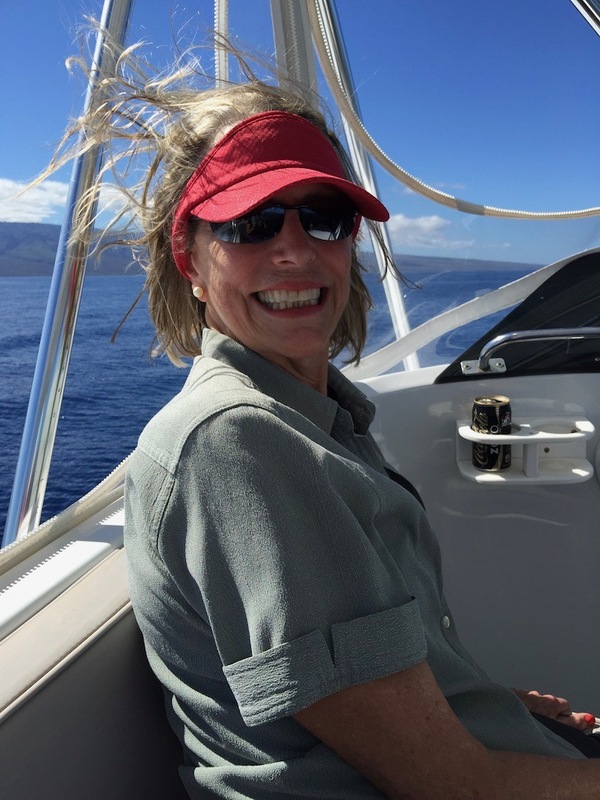 It began when a fan of Austine’s at Maui Jim saw a photo of her wearing polarized sunglasses as she worked. So they offered Austine a pair of sunglasses to work in, and just like Maui Jim customers the world over, once she had a pair of Maui Jims, there was no competition, she was a Maui Jim loyalist for life! With that, a synergy was born. 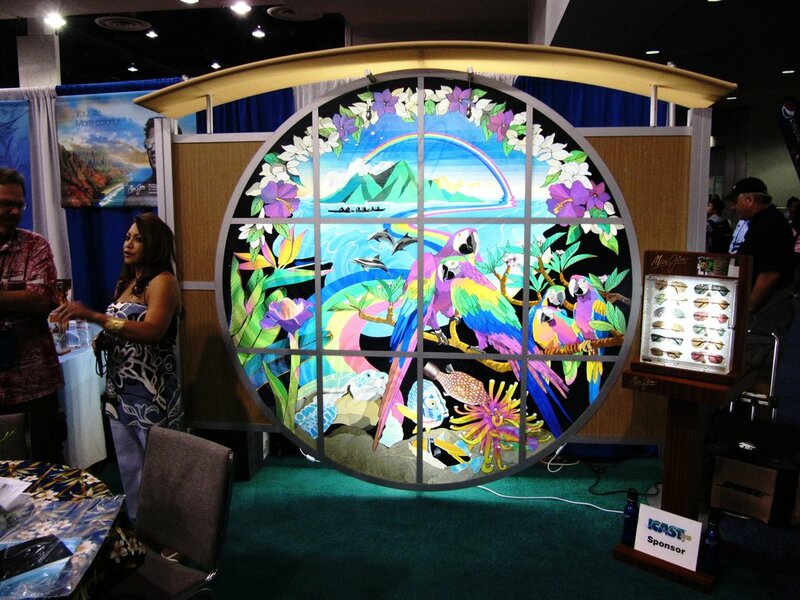 Maui Jim commissioned a variety of interactive Hawaii-themed works for fine eyewear stores to highlight Maui Jim’s superior quality polarized lenses. 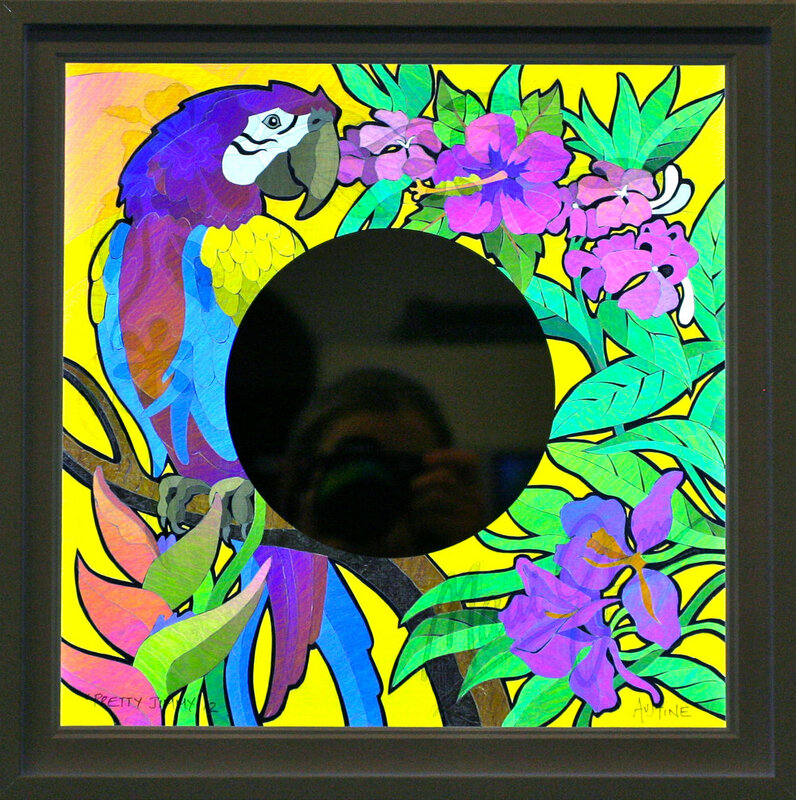 Without polarized lenses, these artworks appear “invisible” except for the colorful Maui Jim logo. But when viewed through Maui Jim Sunglasses, they magically spring into bright, colorful imagery. Austine’s images of nature are a perfect fit for Maui Jim, and Maui Jim sunglasses are a perfect fit for Austine! Every year, Austine designs new fine art edition Polage artworks for Maui Jim to display in the best eyewear stores world wide. Recently she has been creating hand-made Polage fine art in 15 inch square and 25 inch square formats. Many of the Maui Jim Polage® Art commissions have been custom designed to highlight special events such as the Augusta Masters, or to include a logo or iconic image, such as the piece created for Kiawah Island Golf Resort (the two views—with and without Maui Jim sunglasses—shown here). Austine has created a number of very large custom pieces commissioned by Maui Jim for Sunglass stores and for trade shows. The Polage art mural shown below was made for trade-shows. At first glance it appears to be just a wall of light with a little foliage and the Maui Jim Logo in color on it, but through Maui Jim PolarizedPlus2® Sunglasses, a colorful image of a rainbow over Maui and its ocean environment bursts forth. 20 years later, Maui Jim has become Austine’s biggest patron, giving her the opportunity to display her work world wide. Over the years Austine and Maui Jim have found ever better ways to use Polage® art to help highlight Maui Jim’s quality and to play a part in its memorable Aloha spirit. Maui Jim also generously underwrote a major 42-year retrospective of her work at the Lakeview Museum of Arts Sciences in Peoria, IL. Maui Jim manufactures the finest polarized sunglasses in the world, bar none. So, of course Austine always wears her Maui Jim Sunglasses when working on her art—and outdoors too. Austine wearing her Maui Jims in Maui! Jimmy, Maui Jim’s mascot, frequently appears in Austine’s artworks for them.